Dwane Hall was near the door of his Sportsmen's Tavern on Thursday evening when Michael Anelli walked in. Anelli had been Hall’s principal at Riverside High School in Buffalo in the early 1970s, and Hall was pretty sure he remembered their last true conversation. They were sitting in Anelli’s office with a truant officer about 48 years ago, while Anelli kept telling Hall he had to stop skipping school. At the bar the other night, Anelli, 84, did not seem worried about the past. “I hear you’ve got free beer,” he said to Hall, and they laughed and shook hands. Anelli said he was heading upstairs, a guest at a meeting of the Riverside Alumni Association. Hall planned on stopping up later, but the sight of Anelli, for an instant, caused a familiar gut reaction. Somewhere, he felt a faint ache of regret. 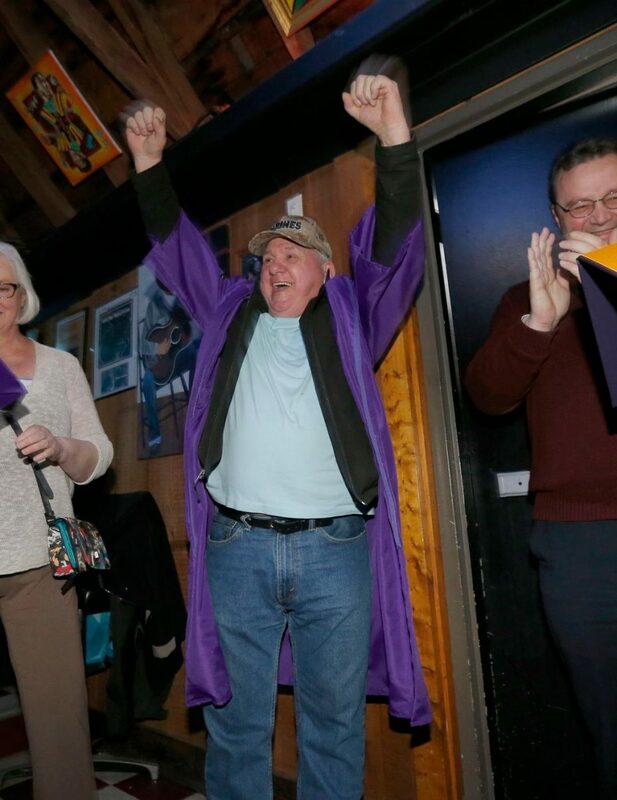 “He doesn’t think he’s done anything to deserve what he gets,” said his wife, Denise, an Annunciation graduate who grew up a couple of doors away from Hall on Military Road in Black Rock, then married him when they were both 18, in 1972. She was also one of the co-conspirators in making sure her husband finally resolved an absence that had bothered him for almost a half-century. Anelli was there to surprise Hall with a high school diploma, the one Hall never received because he left Riverside as a junior. The planning started two years ago when Hall casually mentioned to Harold Christie - a Sportsmen's regular who often stopped in on Tuesdays to watch his son Michael play trumpet with the Joe Baudo Big Band - that he had never graduated from Riverside. Christie came up with the idea of presenting Hall with a diploma. He brought that plan to alumni association officers Ann Maliszczak, Cindy Kosanovich, Lauren Poveromo and Rita Kontak, and the little group quickly asked Denise to join their cause. The Riverside officers stepped into leadership positions when longtime association president Ruth Harding Hawthorne, now 85, wrote in a newsletter that the group might be in trouble without some new blood. Kosanovich, concerned, started recruiting her friends. Like the neighborhood itself, the association is rebounding in membership and passion, and its officers looked for a galvanizing cause. Coming together around Dwane Hall was an easy choice. That journey is reaping high honors. In 2015, the Ameripolitan Association named Sportsmen's the best venue in the world for Americana, which Hall defines as roots music. Last year, the Buffalo Music Hall of Fame brought in Hall as a Pioneer Award-winning inductee. This August, Sportsmen's will begin hosting outdoor shows as a regular attraction, behind the tavern. Hall comes across as a soulful blue-collar guy who understands how to evolve and adjust without surrendering what matters, an apt corollary in 2019 for what his city wants to be. Denise knows her husband struggles to see it in that way. She met him when they were children. Hall's father was a backhoe operator who played country guitar. Her dad worked at a lumberyard. Long before they dated, the couple hung around with the same group of kids. Their courtship was part of what Dwane calls a “natural state,” the way everything in his life seems to roll out the way it should, without too much overthinking. While he started out as a freshman at Riverside in 1968, Hall soon came to accept a simple truth. “I hated school,” he said. He and a good friend named Dave would hide their fishing rods in the woods, near a hole in the fence by the football field. They would walk in the front door and flee out the back, sometimes pursued by Anelli and his staff. Once safely away they would fish at the Niagara River, until the absences piled up and counselors cornered Hall one day and suggested a new destination. They thought it would be a good idea for him to attend a tightly monitored industrial school. Hall had no interest. Even as a teen, he felt he was drifting and needed a big change. He went to his father and said he wanted to quit school and join the Marines. “The greatest thing that ever happened to me,” Hall said. It was the Vietnam era. While he was not sent into combat, he said the Marines gave him discipline, direction, a much clearer sense of self. He married Denise and their oldest son, Jason, was born in Hawaii. Once the couple came home, they knew exactly where they wanted to be. They settled in Black Rock. For 10 years, Hall sang and played guitar at night and did such jobs by day as using high-pressure water to clean chemical tanks. Denise's father loved to stop at Sportsmen's for a beer, and Hall started going there to shoot some pool. In 1985, he and Denise agreed to manage the place when the owners ran into some health problems. “It was still a beer joint,” Hall said, but the band he founded decades ago, the Stone Country Band, began playing there routinely, and pretty soon they were inviting friends to perform. By 1988, the Halls owned the building. Eventually they added a stage, and they knocked out some old apartments on the second floor and created a balcony, and before long many well-known performers were walking through the door. They stayed there when the neighborhood seemed fragile, when many people lost hope, and now they can feel so much is coming back. They are grandparents, and their sons Jason, Jeffrey and James all work with them. Denise looks at her husband as a 64-year-old guy who lifted his city and stayed close to his family and managed to reaffirm his own art, enough true success to make anyone proud. Still, she knows he sometimes wonders what he missed by leaving school. "I must have thought about getting my GED a gajillion times," Hall said. His friends and classmates decided to resolve that issue. They went to Common Council Member Joe Golombek Jr. 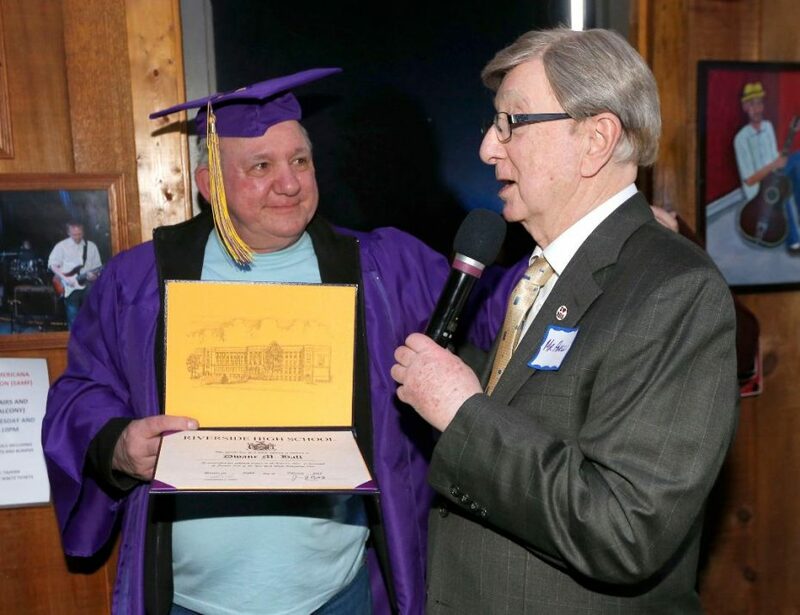 He took their request for a diploma to the school district, where staff members made use of a program that can provide degrees for wartime veterans who left school early to join the military. The process required specific documents. Denise sneaked them out of the house. Finally, the Riverside alumni officers asked Hall if their association could have what seemed to be a routine mixer on the second floor of Sportsmen's, and they hunted down Anelli, Riverside’s long-retired principal, and brought him in to help pull off the surprise. On Thursday, Maliszczak used a microphone to call for everyone’s attention. She told the gathering the officers wanted to say a quick thanks to the Halls. The couple went up front, where Anelli was waiting, and all the preparation came together perfectly. Out came a purple cap and gown and the diploma. Off went a Marine Corps hat and on went the mortarboard. Hall, in disbelief, raised his fists in triumph. 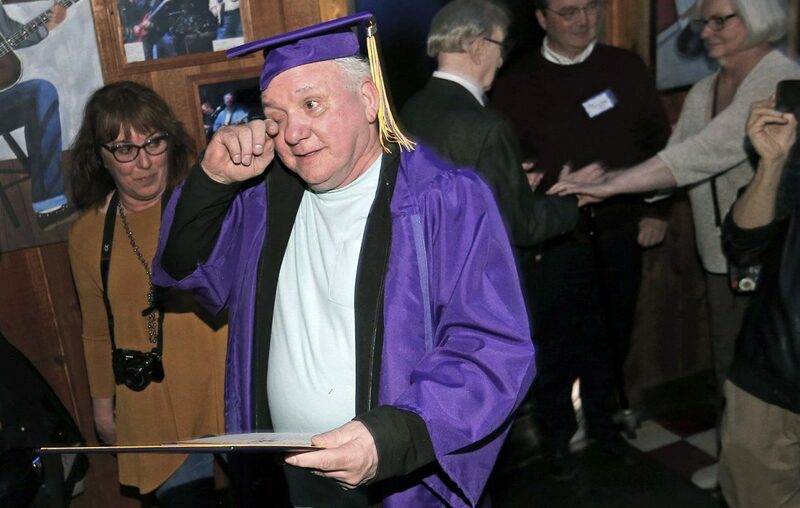 Anelli – the same guy who once brought down the disciplinary hammer – officially handed over the diploma, and the scene transformed into a blizzard of hugs. Hall leaned over and kissed Denise, then stepped back to wipe away tears that were rolling down his face. As for Hall, no big fan of talking about himself, that kind of praise left him unsure of what to say. Yet Maliszczak said there was no need to find the words. Two hours later, when she left, Hall still wore the cap and gown.